Port authorities often face the dilemma of allocating what share of total costs to what group of port users in order to generate sufficient revenue (which is assumed to be known in the thesis). There is no consensus between port authorities on this issue. Moreover, port authorities often do not make use of specific pricing mechanisms on which they base their pricing decisions. Often pricing is merely based on tradition. Compared to other infrastructural objects, such as roads or airports the inconsistency and complexity of the pricing situation in seaports is quite unique. In order to find answers that solve the dilemma of port managers the applicability of the two-sided market theory is tested on seaports. To do so useful insights are borrowed from the literature that tests the applicability of the theory of two-sided markets on airports. It is argued that seaports do not fit the assumptions underlying the two-sided market theory. What is obtained from the analysis is that port authorities can in broad terms be seen as multiproduct companies operating in vertically related markets, in which some port users – shipping lines and (hinterland) logistics service providers – cause vertical externalities that have an positive influence on other port users. 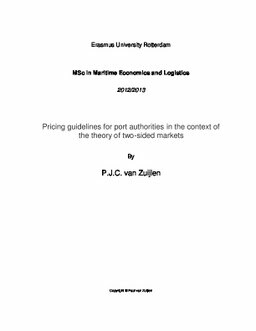 Subsequently a number of port pricing guidelines are introduced that port authorities can use in order to deal with the pricing dilemma of allocating what share of costs to what group of port users. These guidelines take into consideration the insights that are provided by the analysis of the two-sided market theory. In the last part of this thesis the guidelines are combined in such a way that per port user group a pricing strategy recommendation is introduced. The reason for not answering the management dilemma by means of a ready-made price allocation is due to important port specific characteristics that can have a major influence on the optimal price strategy.